I like to say that this is what I looked like before the Princess kissed me. 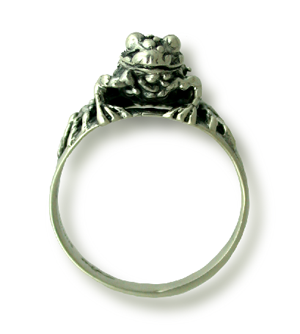 The frog ring was created from a frog I had made. It was a difficult sculpting job and I had almost made the mistake of casting it when it wasn�t quite ready. It was a good lesson in patience. 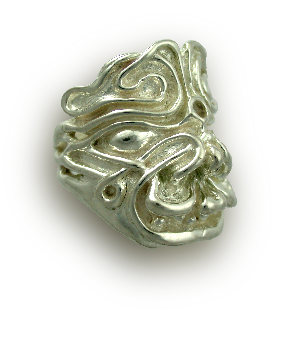 With the enthusiasm I had at the time I was eager to get it done and see the results in silver. I wasn�t happy with the back legs and decided to wait another week and fix them. After a real sculpting struggle I finally got them right and cast them the following week. It made me realize how important it is to do things properly and have the patience and wisdom to wait. Nothing by half! 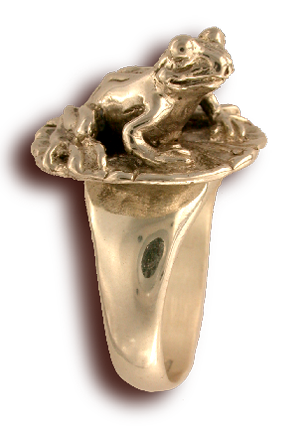 An old friend commissioned it to be made into a ring for her goddaughter as a graduation present from a school who�s mascot is a frog. The ring turned out well and I am very proud of this design. 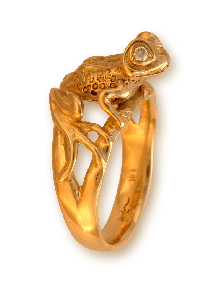 This is the Frog Ring in 18K gold with diamonds in the eyes. The skin on this one has small circular impressions to denote the patterns on a frog�s skin. 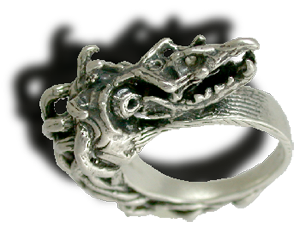 This ring also looks great with Emeralds and Rubies for eyes.. 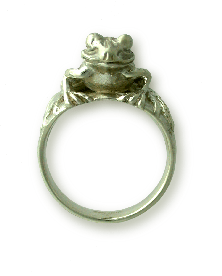 The toad ring is a version of the frog ring modified by adding warts and bumps. I often make moulds of found bones or things like crow or grouse feet and use the resulting forms in a variety of ways. This bird was found dead and I used its beautiful talons to make this ring. This is a design which is on a sword scabbard found in Mortonhall, Scotland and is dated 79 AD. 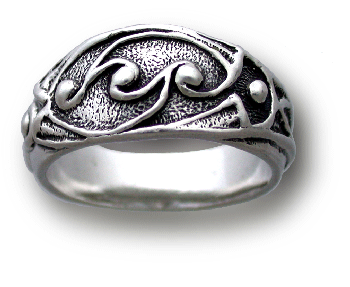 The design is a wonderfully elegant symbol typical of Celtic craftsmanship of that time. 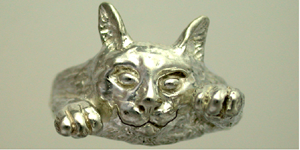 My sister sent me a picture of her cat so I made a ring using the same image and sent it to her. The cat was originally named Dusty but her husband liked the name Walter and it stuck so the ring is of Dusty Walter the cat. This was an experiment with weaving and texturing soft modeling wax and using bits from various moulds of bird and mouse skulls to create a strange new creature. It's called "Rasta" ring because the hair part looks a bit like dreadlocks. My brother made some birds in clay about 2 or 3 inches long. 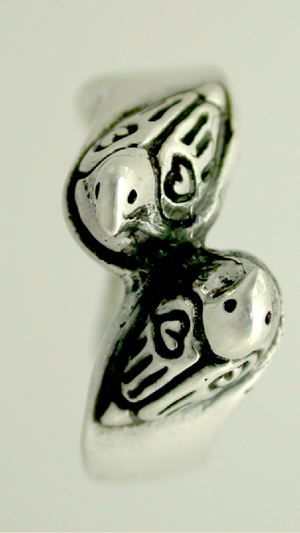 I sculpted small ones for this ring and put hearts on their wings. This was the first in what has yet to become a series of facial parts, which by combining will make a whole or partial face. It has a patina which will slowly change as it is worn over the years. I like to make jewellery that you can play with. This frog on a lillypad spins around and is a good fidget ring. This was the result of just submitting to the knife and file without too much conscious direction or thought. Letting the piece reveal itself in the process of carving is one of my favourite ways of starting out. The image congeals as I go and I just follow the path as it emerges. 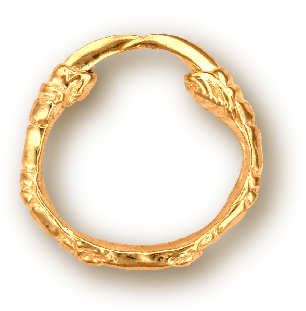 This design is from a ring found in the Danube river and is from the 6th century BC. Its strength and simplicity really impressed me and carving it made me appreciate its subtle beauty. 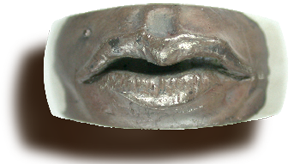 This Ring was made using homemade wax modeling tools and was really just a challenging exercise in sculpting just for the fun of it.It turned out looking a bit like a maya motiff and there is room for a stone in the hole in the forehead. 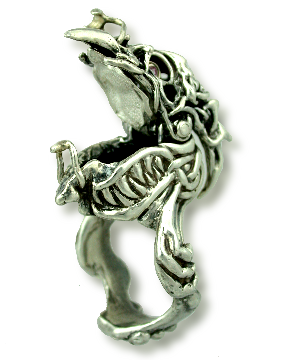 Using the single piece that was created and used in 6 pieces for the "Chaotic Celtic" Bracelet, this ring has two hinged articulating pieces which lock with a catch. The inside lid serves as the seal to a fairly large chamber as well as the base for raised settings for the stones which comprise the inset eyes. The outside "Head" tilts back to open and when closed is locked with a catch that swings over and snaps over the "beak". The design is one which draws on memories of putting together hotrod and ratfink models as a kid in the mid 60's and also the new strange graffiti based and contemporary underground artwork found within the likes of "Juxtapoz" magazine. 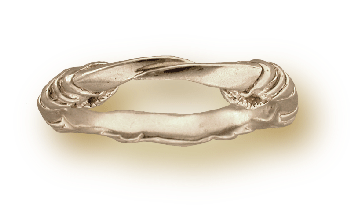 A ring with a central hinge which allows movement with all the pieces. The shank,crow head,lower beak,hematite bead (which serves as eyes)and 1/2 shank which the frog sits on, all move. The crow mask on the frog tilts back to reveal the frog. 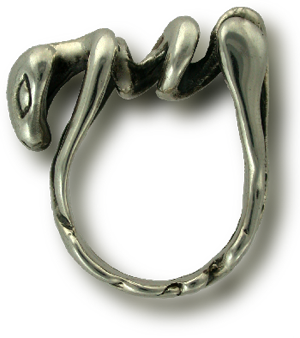 This is a fidget ring and can be shaped into all sorts of different configurations. 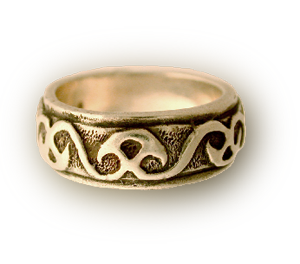 This fidget ring moves in a variety of configurations and is a consummate fidget ring. Once you start playing with it, it is hard to put down. It can be worn on a chain if desired.